We're publishing a book! It’s a collection of all the good stuff we do on our courses. It’s full of self-care tips, exercises and thinking that will help us all live a happier and more fulfilled life. 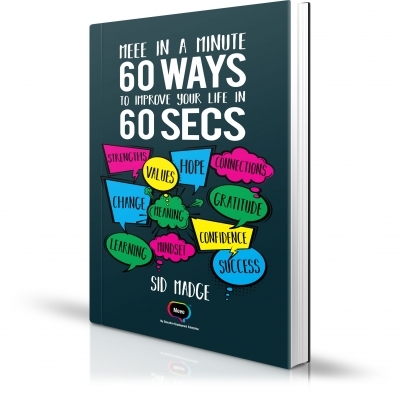 The book is called “Meee in a Minute 60 ways to improve your life in 60 seconds” and is made up of 60, easy to follow chapters of one – minute reads and exercises to help us understand who we are, why we do what we do and why we make the decisions we make. The Meee Programme started 3 years ago during a session with Sid where a 15-year-old boy answered the question “what one word would you use to describe yourself?” with “weirdo”. We were horrified to believe that any young person could think this way and mean it. So, for a year we researched the facts behind suicide, self-harm, unemployment, bullying etc and realised that something needed to be done to help people of all ages believe in who they are and what they are capable of. Depression will affect 1 in every 10 people in the UK and 4% of children in the UK are recorded as anxious or depressed 1. These shocking statistics highlighted the importance of mindfulness and managing our own self-care to Sid. Mindfulness is a powerful tool used to help improve your happiness and learning to enjoy life around you. Professor Mark Williams from the Oxford mindfulness centre states that ‘an important part of mindfulness is the awareness of our thoughts and feelings as they happen, moment to moment’ 2. Having spent over 25 years working for some of the worlds biggest branding and marketing agencies, Sid decided to use his creativity to create tools that help people to develop their own mindfulness. To date we have used these to help over 1,000 people from the age of 7 to 72 in Wales and the north west of England. We’ve worked throughout jobcentres, prisons, schools, community centres, universities and homes. 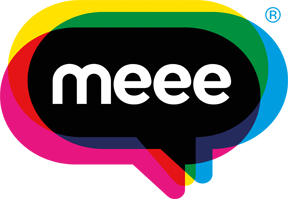 The Meee Programme focuses on the 3 E’s – Education, Employment and Enterprise. Despite the play on words it’s all really about you, the individual. The vision of Meee is to inspire each and every person to believe in themselves and what they can achieve. We work with people from all ages and backgrounds. Some are young children, teenagers confused about their next step, those who have been excluded from school or the long term unemployed or those people in prison. Without exception, we work with those people who may have found themselves in places they didn’t expect or those who may have taken a wrong turn because the school system may have left them behind or they just didn’t receive the additional support they needed to enter employment or pursue their own ideas. A poor choice or bad decisions made in just a minute, changed the course of their life. This book is a celebration of what we have learned over the last 3 years. It’s a collection of life hacks, advice, insights, science, stories, short exercises and thought experiments to help improve your life in under one minute. Sometimes all we need is a shift in thinking to allow us to see a new perspective, shake off our funk or access a different option for optimism and action. We can imagine change to be an endless uphill battle but sometimes a minute can change your life. Head over to https://meeebooks.com/ and leave us your name and email address and we can let you know when our book is ready! Don’t forget to also check out our Facebook, Twitter and Instagram to keep up to date on all of the fun stuff we do. Have a minute spare? Change your life TODAY! Sign up for more book updates.